How is it Day 3 of my festive food guide already? I hope you’re enjoying reading these as much as I’ve enjoyed researching and writing them; as you’ve probably already guessed, I love all the delicious food that comes out around Christmas. This food guide starts with the meat, as most do. Gareth went through the book several times to find one he would choose for our Christmas dinner if we were ordering from there. He could only find one turkey crown which he’d like and that was Taste the Difference free-range bronze turkey crown with an apple and Armagnac stuffing. I think it was the smoked streaky bacon lattice which swayed it for him as even I know that it keeps the meat moist. This will set you back £37.50 and will feed between 4-6 people. The other meat he picked out from Sainsbury’s was the Taste the Difference West Country boneless beef rib with a horseradish glaze and mustard and herb crumb. You’ll quickly notice a theme in these food guides in that Gareth chooses beef rib almost every time! This was is £35 and will serve 10 people so you’re getting a bit more for your money. I haven’t been blown away with any supermarket’s vegetarian options (except for Day 5’s so you’ll have to come back and check that out!) Sainsbury’s did have a couple which sounded tasty like the Taste the Difference layered root vegetable stacks which have a cheese and thyme sauce. These would also make a good starter, you get 2 in a pack and they’re £6.50 each. The other one which I liked the sound of and might have been swayed to buy was the Taste the Difference truffled cauliflower cheese en croute. I’m a sucker for cauliflower cheese and pastry so this sounded amazing however it’s £9 which is a bit much for me to pay for a main. Sainsbury’s have a luxury vegetable selection which is £14 but it does contain roast potatoes with goose fat, braised red cabbage and my favourite, cauliflower cheese! It serves 4-6 people so it does take away a lot of the prep work for you on the big day. The other side which sounded amazing, and one which I think we’re going to have to get, is the Taste the Difference maple-glazed sweet potatoes. I’m not usually a fan of sweet potatoes but these sound amazing, it’ll give an American taste to a very English dinner. They’re £5 and should serve 8 people. Next is the party food. The book doesn’t have a lot of options which is unfortunate but there were two which sounded ideal. 100 piece international snack selection by Sainsbury’s which contains Indian food, Chinese snacks and some American delicacies too such as chicken tikka samosas, vegetable wontons and chilli cheese bites. It would be perfect for a festive party and it costs £16.50. The other one I liked was the Taste the Difference 32 piece cheese filo tart selection. If I’m honest, cheese is the one thing stopping me from going vegan. With three cheese combinations, these filo tarts would be a perfect snack for vegetarians…we don’t always want spring rolls or stuffed peppers! Now onto the best part of the meal; dessert. The first one I’ve chosen would be a real showstopper at the dining table and it’s the Taste the Difference melting Belgian chocolate billionaires dome. Pour over the hot salted caramel sauce and watch the chocolate melt away, revealing fudgy brownie and chocolate mousse. It’s £12 but will serve 10 people so perfect if you’ve got a few guests coming. The other one I liked was quite cute more than luxurious but I thought it’d be a good dessert if you’ve got children. Rudy the Reindeer hidden centre cake is decorated to look like an adorable reindeer’s face, complete with red nose and antlers. But when you cut into the cake, shortcake snowballs will spill out. This cute cake is just £10 and there will be plenty left over after the celebrations are done. If you want to order your food in-store, it’s really simple. Just fill in the form which you can find in the centre of the book and hand it into your local Sainsbury’s customer services. You can then collect it from your chosen store on either the 22nd, 23rd or 24th December after you’ve paid a £20 deposit or the total of your order if it’s lower than £20. Online is similar, just browse the Sainsbury’s website and choose which items you’d like. Then pay the deposit of £20 as above and collect in store on the same dates. See, it couldn’t be simpler! 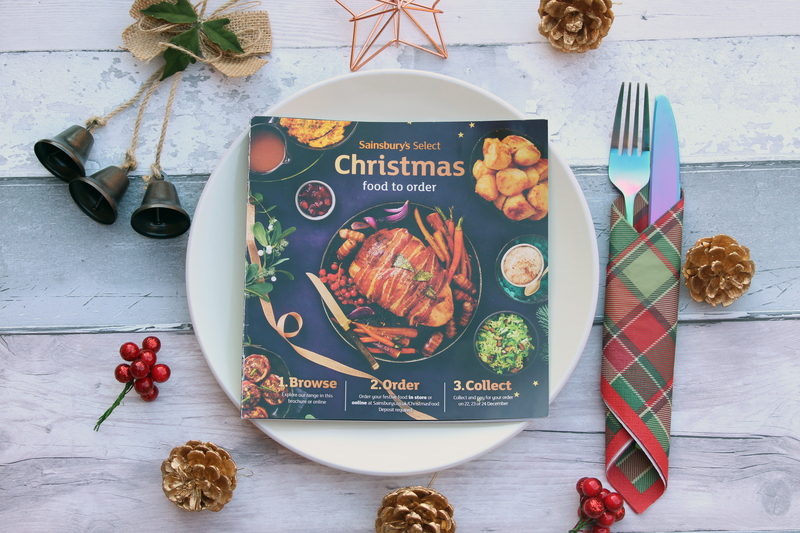 Tomorrow is the fourth day of my Festive Food guide and we’ll be heading to Marks and Spencer to see what they’re offering this year, make sure you come back to check it out.